IABM announced the shortlisted entries for its new Broadcast and Media Awards (BaMs™). From an initial 100+ submissions, the judges have shortlisted four entrants in each of 10 newly-defined categories that accurately model the structure of the industry today. The newly defined categories ensure that all aspects of the broadcast and media industry are included including the very latest cutting-edge developments. The panel of 40+ non-affiliated, expert judges are now scrutinizing the shortlisted entries. Visits to the booths of companies shortlisted will take place once NAB opens to ensure they have complied with the rules of entry. 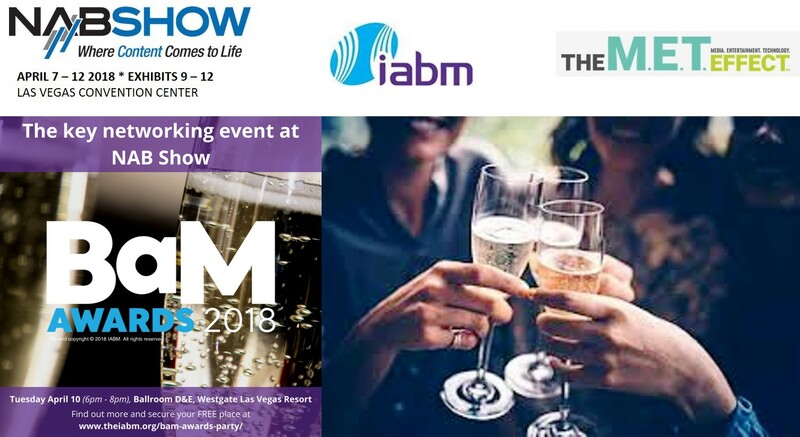 The eventual winners will be announced at the IABM BaM™ Awards ceremony and party on Tuesday 10th April. Venue is Ballroom C at the Westgate Resort, adjacent to the Las Vegas Convention Center, 6pm onwards. This year's NAB Show opens in five days: The show floor showcases the latest game-changing tech, craft-altering trends and cutting-edge tools that change how we create, manage, deliver, consume and monetize content, no matter the purpose, no matter the screen. As of today we feature 64 companies and their approach at the NAB2018 Show. This list is continously updated. NAB2018 opens on 07April at the Las Vegas Convention Center. Named for the year in which ESPN was founded, 79 is Game Creek’s third IP truck in less than four years, following Encore in 2015 and Yogi in ’17. With each new build, Game Creek has learned from and improved upon the previous IP infrastructure in order to take advantage of existing IP-based technologies and prepare for what’s to come. The 53-ft. expando comprises an A and B unit: the A unit houses the main production area, audio production, and core engineering; B unit, graphics, replay, and editing. One of the most noticeable highlights of 79 is the largest production area ever constructed by Game Creek, with a monitor wall that can display for more than 200 images at once. Produced by Raycom Media’s production company, Tupelo Raycom, TNDV was on hand to provide technical services supporting the 1080i HDTV recording of the live event, which aired February 11, 2018 at 9pm ET on Bounce TV. As a multicast DTV network owned by The E. W. Scripps Company, Bounce TV is carried on secondary DTV channels by local broadcast affiliates nationwide, reaching 95% of all African American households. To support a live event of this magnitude, TNDV contributed its flagship 3G/4K mobile production unit, Exclamation, a 53-foot double-expando trailer specifically designed to handle the technical and creative demands of large-scale sports and entertainment broadcasts. HDR Denmark selected Nevion’ s software-defined media node Virtuoso for JPEG 2000 IP WAN transport with FEC protection, its VikinX Sublime X2 hybrid router for baseband routing in the central facilities, and some Flashlink equipment for AV processing and Tally. HDR also picked VideoIPath to control the whole set-up from the central location. The implementation process ran smoothly, with the solution going live just three months after the project started – in time for the launch of a new Race Track channel in January 2018. Regular productions are now taking place, with just one cameraman and two journalists at the race-track and one host, one guest and one producer at the central location in Copenhagen. Austrian production specialist, Mediahaus, has delivered live coverage of the inaugural European Snow Volleyball Championships with a Blackmagic Design multicam set up, including two URSA Broadcast cameras. Staged at the top of an Austrian ski resort, in a specially constructed snow stadium, the finals were broadcast live on channels including ORF and Eurosport. Mediahaus delivered an international feed, big screen coverage for spectators and livestream content from a portable OB set up, built around an ATEM Television Studio HD Pro. A quartet of Blackmagic Design cameras not only captured the action on court, but also the fun and funky atmosphere at the event. Thrash heavy metal megastars and heroes Metallica are in the middle of a world tour following the release of their number one album “Hardwired … to Self-Destruct” at the end of 2016, featuring a stunning and provocative in-the-round production design by Dan Braun for the arena section, with highly creative lighting by Rob Koenig and 72 x Robe BMFL WashBeams from Premier Global Production as the main lighting fixtures on the rig. Rob has worked with the band for around nine years, and in that time, they have performed several in-the-round tours. It’s a format they prefer for getting physically and psychologically closer to their fans. For this one – which started with a stadium section and is currently playing arenas – Dan’s idea was based around 52 x 1 meter square video cubes suspended above the stage, 36 of which are on steel cables and a custom motion controlled hoist system developed by TAIT and the other 16 are in fixed positions. Having remained in the charts for 13 years, Vegas indie-rockers The Killers are undeniably one of the biggest bands of the 21st century. Currently touring their fifth studio album, Wonderful Wonderful, the award-winning septet is travelling the world with an Americana-inspired show design, lit by long-term lighting designer Steven Douglas, who selected the Claypaky’s Scenius Unico as the production’s workhorse lighting fixture. From the start, the band, Douglas and the rest of the creative team decided against a fixed creative brief for this production. Instead they worked on growing the show design organically during the recording of the Wonderful Wonderful album. The resulting production features The Killers’ idiosyncratic Vegas styling, alongside theatrical small-town Americana set-pieces, inspired by the nature and feel of the album’s music. Fans of US rapper A$AP Ferg are treated to dynamic live footage and effects on his current Mad Man tour, through a slick stage design that features custom-built onstage robot cameras and a large HD video wall powered by Avolites Ai RX8 Servers. Lighting designer, video director and programmer for the tour is Michael Smalley of Twin Designs, who in the past has worked with artists including Pitbull, Shakira and Bassnectar. Smalley collaborated closely with production design company Vita Motus and LA-based technology design firm VT Pro Design to deliver the show. "The artist wanted a clean, runway look, like a high-end music video shoot," explains Smalley. "The cameras on the robot arms capture intimate and close-up shots so the audience can really see every moment on the big screen. This is mixed in with high impact effects to give a dynamic range to the show." The IP-based Lawo production consoles – each with 64 faders and providing 270 DSP channels, a routing capacity of 5120x5120 crosspoints, integrated Waves SoundGrid servers and connectivity via four DALLIS I/O frames – mark the first Lawo equipment installations in the Philippines. After a rigorous selection process carried out by ABS-CBN in the preceding months, the order for the mc²56 consoles arrived with Lawo in February 2017. Following delivery and several months required for installation, testing and training – all according to ABS-CBN’s ambitious project schedule – the modernized IP-ready studio control rooms went on-air in January 2018.